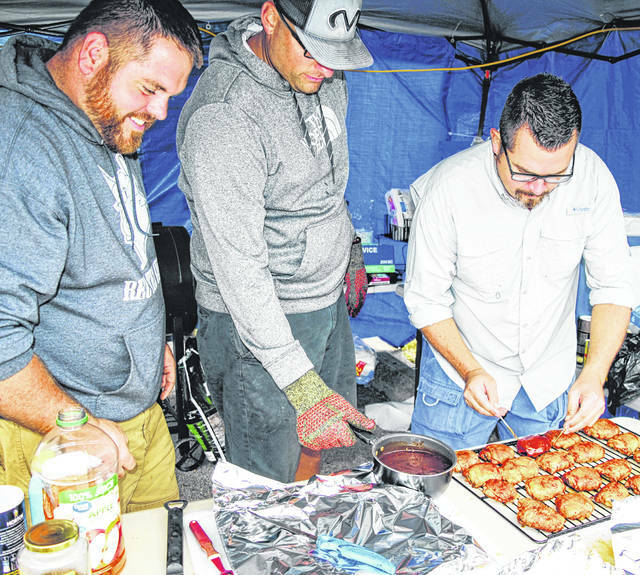 Local Four Guys and a Grill team members, from left, Jason McNeal, Jarrod Haines and Mel McKenzie prepare chicken during Saturday’s Smokin’ in the Hills Barbecue Contest. Brandon Barr, at the cooker, and his Hillsboro area team also included Mike Oney and Larry Sanker. Jason Schlomer works on the Neons BBQ team’s pork ribs while teammate Ian Coughlin looks on. 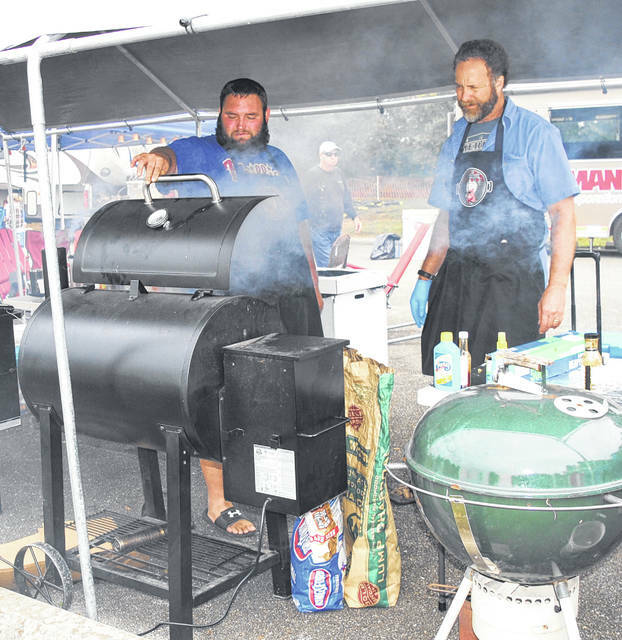 Thirty teams turned out Saturday for the second annual Smokin’ in the Hills event held at Rocky Fork State Park’s East Shore area, and another 14 took part in a pork nachos contest Friday night when there was live music. 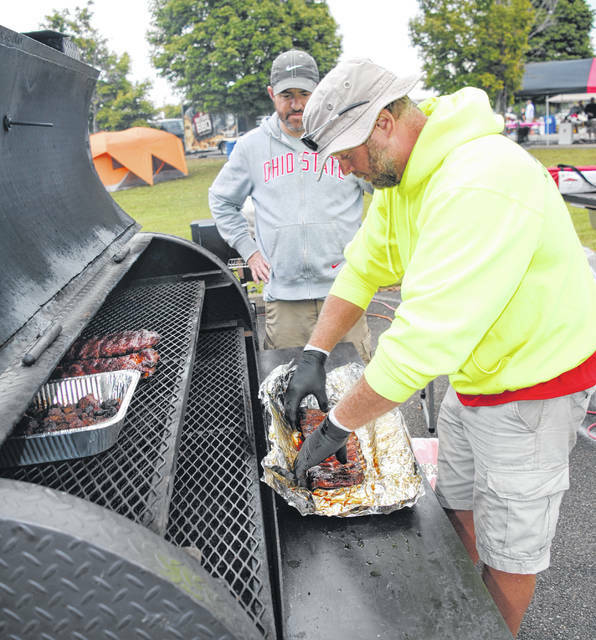 Saturday’s contest, when teams were required to prepare chicken thighs, pulled pork, pork ribs and brisket, was certified by the Kansas City Barbecue Society, a non-profit organization dedicated to promoting and enjoying barbecue. A total of $9,000 in prize money was up for grabs through the main contests and a couple others. She said plans are for the event to return next year on the third weekend in September. Friday’s contest, when patrons were asked to pay $1 for each sample and vote for their favorite nachos, was won by the Smoke Rider BBQ team of Curt Jefford and Brandon White, from Columbus and Carroll, respectively. Purdin said the 30 teams were five more than the inaugural event a year ago. She said there were supposed to be two more teams, but one was stuck in South Carolina and another was in an auto accident on the way to the contest that damaged its cooker. There was also a kids barbecue contest Saturday sponsored by Southern State Community College for those ages 7 to 15, who were required to cook six mini hamburgers. That contest was won by Piper Wilkin of Hillsboro, whose father, state representative Shane Wilkin, was the driving force behind bringing the contest to Highland County a year ago. The weekend before the barbecue contest there was a Smokin in the Hills Queen Pageant. Jennifer Cope from Lynchburg was crowned queen and will represent the event at festivals and other events around the state over the next year. Taylor Brewer, a student at McClain High School, was the first runner-up, and Meghan Cope, Jennifer’s twin sister, was the second runner-up. There was a KFC Kids Zone that opened at 10 a.m. Saturday where kids could enjoy face-painting, caricature drawing and two inflatables including a 24-foot slide. R + L Carriers had a race car display at the event and was the main sponsor. “It was really neat because the kids had a blast,” said Mechell Frost, executive director at the senior center who helps organize the event. Other Smokin’ in the Hills officials did not immediately return calls Monday seeking comment. For complete results from the event, visit https://www.kcbs.us/event/7784/smokin-in-the-hills.